Thousands took to the streets of Vancouver Saturday to protest Kinder Morgan's Trans Mountain pipeline expansion. 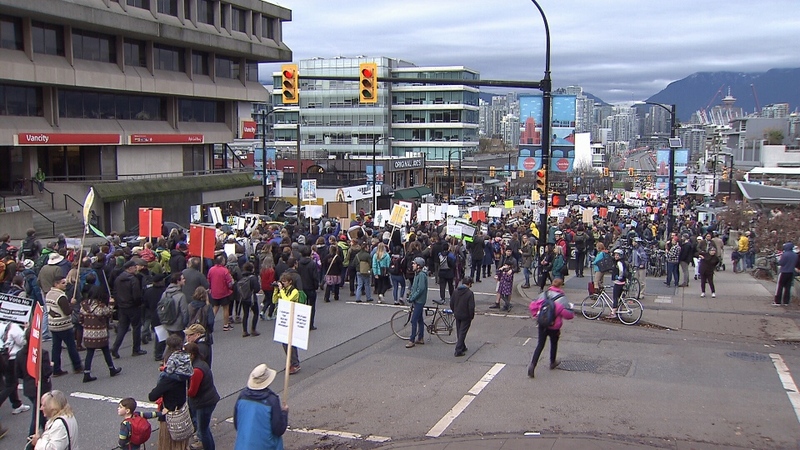 The Mayor of Vancouver, First Nations leaders, Members of Parliament, and environmental activists were among those that marched from Vancouver City Hall, across the Cambie Bridge, and to Library Square. 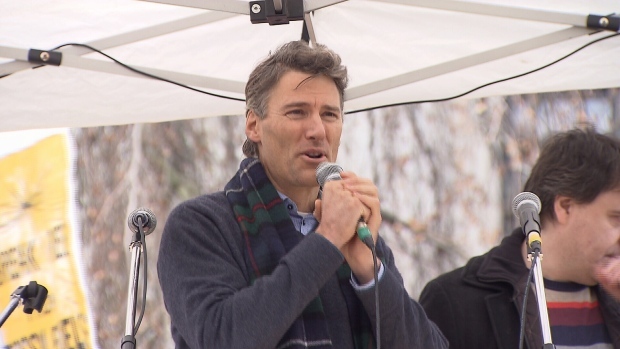 “Thank you for making this the most important meeting we’ve had at City Hall in our history,” Vancouver Mayor Gregor Robertson said to the massive crowd at the start of the protest. Signs reading “No consent, no pipeline,” “Defend the coast,” and “Stop Trudeau’s pipeline” abounded. 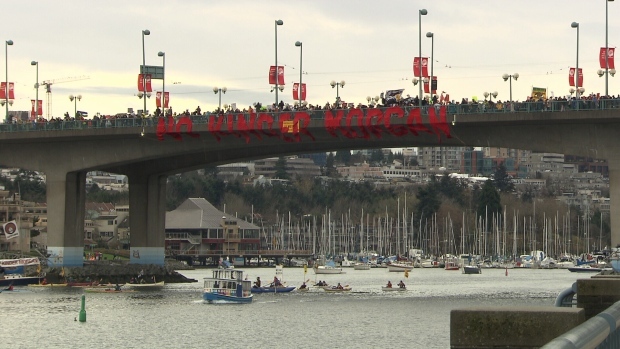 The Cambie Street bridge was covered in a red banner simply reading, “No Kinder Morgan”, while kayakers with signs dotted the waters below. The controversial $6.8-billion project would link Alberta’s oil sands with Metro Vancouver’s harbour. Activists say the project will have consequences for the land title and rights of First Nations communities, increase tanker traffic and risk for environmental disasters on B.C. 's coast, and worsen Canada's impact on climate change. “The evidence Kinder Morgan put forward is not worth the paper it was written on. It was never tested and there was no cross-examination,” said Elizabeth May, leader of the Green Party and MP for Saanich-Gulf Islands. “Metro Vancouver has voted against it, the Lower Mainland and local governments have voted against this, the city of Vancouver has been adamant – no has to be the decision. It’s not worth the risk,” said Vancouver City Councillor Adriane Carr. 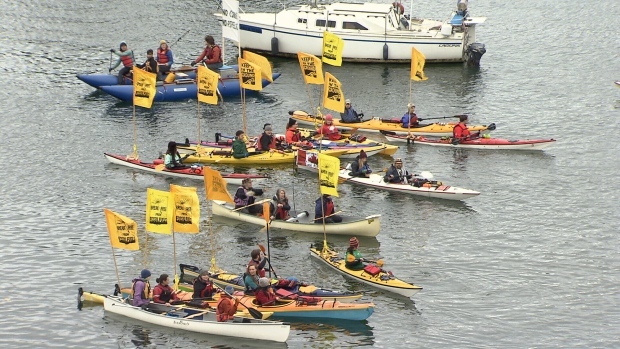 Thousands in Vancouver will do whatever it takes to Stop #KinderMorgan. 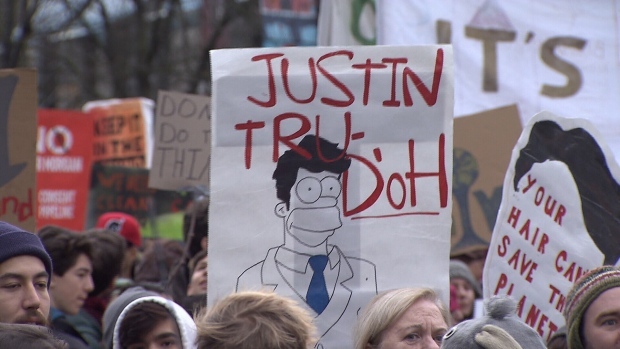 Trudeau has promised a pipeline decision by Dec. 19 – and protestors promise their demonstrations will only grow bigger. “We’ve been strong, solid and fierce about our opposition to this pipeline proposal and seven-times increase in oil tankers in our waters,” said Robertson. Thousands took to the streets of Vancouver Saturday to protest Kinder Morgan's Trans Mountain pipeline expansion. (CTV News). Nov. 19, 2016.